The widespread availability of AEDs, automated external defibrillators, is a huge step forward for public health. Sudden cardiac arrest can happen anywhere, and waiting for EMS services to arrive is all too often fatal. Installing a system of portable defibrillators can be complicated, but paying attention to the key safety requirements makes the task simpler. A functioning and properly stocked AED cabinet is the first essential step; beyond that, it is crucial to develop plans for user training, awareness, and strategic AED locations. Having an established AED program in your establishment will help the general public feel safer and be safer. AED cabinets come in several configurations. The main differences come from how they are installed into the wall, and how the alarm system operates. A common sight at airports: AED cabinets containing portable defibrillators. Recessed cabinets are installed completely within a wall; these take up the least space, but it can be difficult to avoid disturbing interior electrical wiring. Surface mounted cabinets are installed outside a wall; they conversely take up the most space, but there’s no need to modify the wall. With the bulky size of these AED cabinets, it is important to consider ADA regulations for installation (see Accessibility below). Semi-recessed cabinets only protrude a small amount from the wall, combining both the benefits and disadvantages of the above two types. Semi-recessed cabinets are often preferred due to their combination of visibility and ADA compliance . Most AED cabinets have an audible alarm that activates when the door is opened. Alarms serve multiple purposes: they alert bystanders to the nearby medical emergency, and they serve as a deterrent to theft or tampering. You can follow this link to buy an alarmed AED cabinet on Amazon. Some cabinet alarms are equipped with strobe lights, which are strongly recommended as they provide a strong visual signal when hearing an alarm is not easy. The final alarm option to consider is the duration/type of noise that serves as the alarm, which is explained here. CPR Mask - Having a mask available to the rescuer helps them to deliver proper rescue breaths during CPR. Nitrile gloves - Provides personal protection to the rescuer. Trauma shears - As time is always valuable, shears can cut clothing away from the victim’s chest in order to use the AED sooner. Razor - Removes victim’s chest hair for easier AED pad adhesion. AEDs are best placed in areas where the risk of sudden cardiac arrest is highest. The best examples include either areas where people tend to gather (elevators, lobbies, etc. ), or areas where physical activity is common (gymnasiums). The American Heart Association  cites a three-minute response time as the rule of thumb for AED placement. Chances of survival following cardiac arrest begin to decrease for anything greater than a three-minute response time. This means that any given location should be 1.5 minutes from an AED, allowing for a rescuer to travel both ways and respond in time. Placing an AED near a phone is another smart strategy. An AED cabinet should be easily visible from all angles. AED locations should be well marked throughout the building, and easy to find on any maps. Publicity, as previously discussed, is also key to making sure an AED is impossible to miss. The ADA places certain restrictions  on the installation of AED cabinets. Most importantly, the cabinet handle can not be more than 4 to 4.5 feet above the ground (dependent on location) and can not extend more than 4 inches from the wall. For a summary of ADA regulations, visit here. The main purpose of AED programs is to allow for bystanders to respond to sudden cardiac arrest faster than an EMS team can arrive. “Bystander” does not mean anyone, though. As the US Department of Health and Human Services  specifies, an AED should only be used by trained individuals. This makes AED training programs and public registries crucial parts of AED cabinet installation. Making sure facility employees are AED trained is an easy decision, but an important one. The more trained individuals there are in a facility, the safer it is. National groups such as the American Heart Association offer both materials and courses for the training of non-medical personnel. Even with trained personnel, medical oversight is still an important part of any AED program. Ideally, AEDs should be installed under the management of a facility’s medical staff. Oversight should not stop once the program is in place- physicians are important for assessing the function of AEDs both before and after they are used. 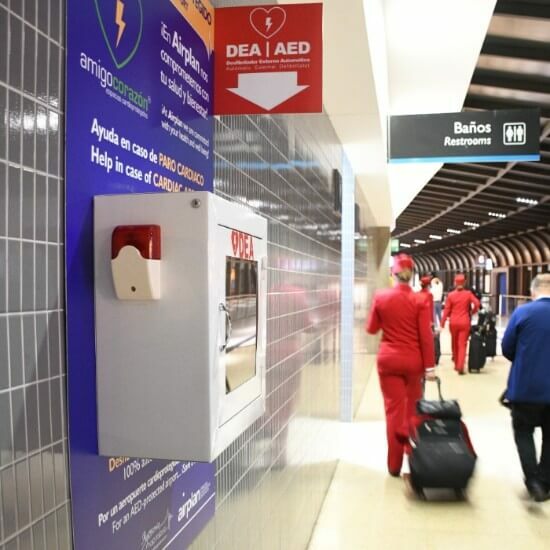 There are multiple nationwide networks in place to ensure that AEDs are used and maintained effectively, the following choices have demonstrated the greatest benefits. Pulsepoint: Pulsepoint allows users to upload AED locations to a national network, making them visible to first responders, 911 operators, and even ordinary bystanders via the Pulsepoint app. National AED Registry: organized by Atrus, this national registry also makes AED locations visible to first responders. Additionally, registration comes with added benefits for facilities, such as recall/expiration alerts and monthly maintenance reminders. Start by placing AEDs in the highest risk locations, such as gyms and lobbies. There should always be at least one on every floor of a building. 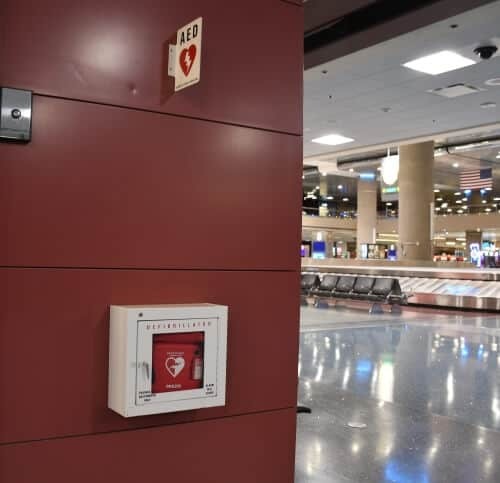 Add AEDs in main corridors until all locations are no greater than 1.5 minutes from a cabinet. Most importantly, AED cabinets must be easily visible and accessible to any rescuer. Programs are best implemented under the watch of medical personnel, who provide numerous benefits throughout all stages of an AED program. Public registration of AEDs is the final step in making sure an AED program is both effective and safe.